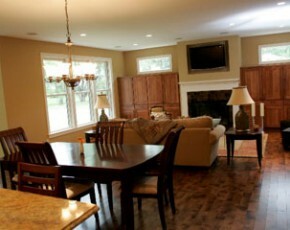 Cabinets have long evolved from being just a big box with a door. Today, they are specialized storage units, built to serve a particular need. You’re probably familiar with lazy-susan cabinets that allow you to use a corner cabinet without losing anything in the very back; they were one of the first specialty cabinets to get widespread attention. 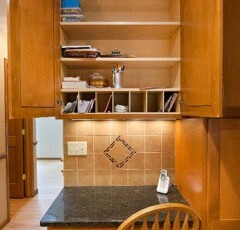 Specialized use can be something as simple as an extra-deep drawer for storing oversized pots and pans, or a clever adaptation that makes uses of previously wasted space, like a three-inch wide base cabinet that pulls out to reveal shelves for spices and other small items, or a tip-out tray in front of the sink to hold sponges. 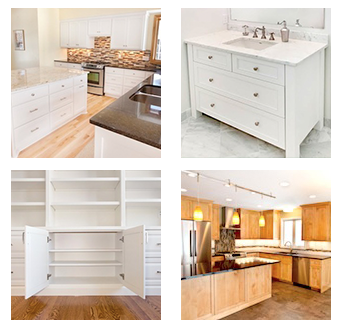 Specialty cabinets is an entire industry to itself, with manufacturers offering all kinds of gadgets and mechanisms to retrofit existing cabinets into “dedicated use” spaces. Most popular are base cabinets that have sliding shelves, allowing the contents to be accessed without bending and rummaging – an important consideration as the population ages. 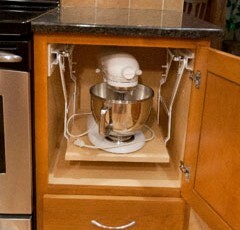 Similar to the sliding shelves are “tilt-outs,” where a pull on the handle tilts the whole unit out at an angle. This is usually used as a platform for a wastebasket or laundry hamper. A huge advantage to having your cabinets custom built is that you know how you use your space and what the inconveniences are, so you can have the solutions built in right from the start. Builders such as the Artisan Cabinet Company in Chaska, Minnesota can incorporate baskets, wine racks, adjustable shelving, pull-outs, and custom dividers – anything you can think of. And they’re not limited to the kitchen, either. As home entertainment options continue to grow, a custom entertainment center might be just the thing for your den, with enough space to hold all of your DVRs, game systems, stereo equipment, etc. And of course, a side table with a divided drawer for all of the remotes and controllers would be very handy, too. 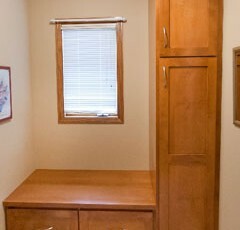 Other rooms that can benefit from specialty cabinets are bathrooms (hampers, bath/beauty products, hair dryers/curlers, towels), laundry rooms (ironing boards, cleaning supplies), bedrooms (armoires, night stands, under-bed storage), playrooms (books, toys, games), and garages (name it). The trick in deciding what specialty cabinets would best suit your needs is not to get trapped in the mindset of “this is a kitchen cabinet, this is a bathroom cabinet, this is a…etc.” They’re all cabinets, and if a “Pot & Pan” drawer works best for you as towel storage, by all means, use it that way. 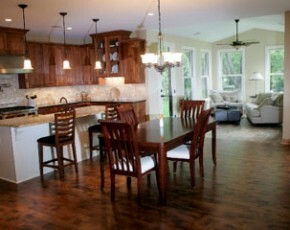 Talk to your custom cabinet maker; tell him what annoys you about your existing cabinets. Chances are pretty good that he will be able to craft a solution to make your life that much easier.